When it comes to social care reform, is government lacking political courage? Back in June, the Institute for Public Policy Research (IPPR) published The Lord Darzi Review of Health and Care. The review set out a vision for the future of health and care which included recommendations for both additional funding and reform. At the heart of the Darzi Review was a recommendation for free adult personal care, as a way of providing high-quality care for everyone in old age, and creating a more integrated health and care system. This idea was explored and discussed further at a recent event hosted by the IPPR and Independent Age held earlier this month in Westminster. Chaired by the IPPR’s Senior Research Fellow Harry Quilter-Pinner, Saving Social Care: The Case For Funding & Reform discussed potential funding improvements and options for further investment. “There have been 12 white and green papers over 20 years, and no fundamental change to the social care system,” said Quilter-Pinner. The event Chair also stressed social care needs to fully aligned and fall under the NHS. “If People have to keep paying for social care, it’s just not going to join up,” he said. This was a sentiment echoed throughout the event, and agreed by the panel, which included Lord David Prior, Chair of NHS England, Christina McAnea, Assistant General Secretary, UNISON, Janet Morrison, Chief Executive, Independent Age. Andy Burnham, Mayor of Greater Manchester, and previously a member of the Health Select Committee, delivered a passionate keynote speech on the current state of social care in the UK. “We won’t have a 21st Century NHS until we support people with dementia as much as people with cancer,” he said. Burnham made a powerful case for ending upfront charges for personal care and advocated a levy on inheritance tax to help align the NHS with care systems, particularly at local level. “Our current social care system is healthcare pre-NHS – we are forcing the most vulnerable to pay the highest fees with everything they’ve ever worked for,” he said. The panel members also presented some startling stats. UNISON’s Christina McAnea explained how at least 25% of middle-aged people think social care is free. And that number was shockingly high among young people also. Lord Prior also agreed with Burnham, that social care should be free at the point of need, and that the Government’s impeding Green Paper should decide how it is funded going forward. 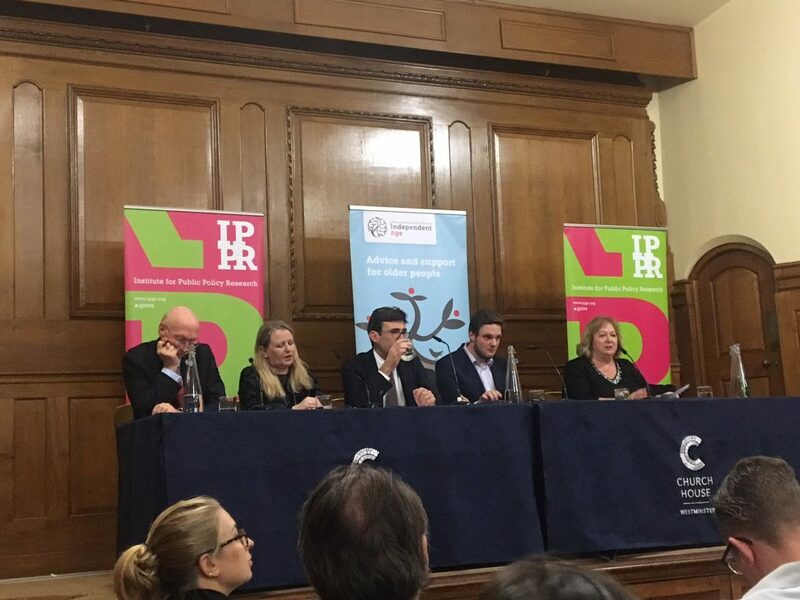 The IPPR event presented a lively discussion, and a strong case for achievable reform, with the panel and audience giving real-life examples and potential solutions to ongoing problems in the sector. Frustrations were shared, grievances were aired, and although conversations about healthcare reform often feel like Groundhog Day, what events like these show, is that passionate, hardworking people are committed to improving our healthcare systems. This autumn, the Government will publish its long-awaited Green Paper on social care, setting out its strategy on securing better and substantive care going forward. Then will we see if future healthcare plans echo the thoughts shared at this event.